For our final bit of AMD news today, in a bit of an unusual move AMD has informally announced a new Radeon HD 7750. The new 7750, which will not be replacing the old 7750, is a higher clocked, higher power consuming Cape Verde card, which takes advantage of the fact that AMD had to underclock the 7750 for power consumption purposes. As you may recall the original 7750 was designed to be the most powerful 75W card on the market – the limit for power from a PCIe slot – and to get there AMD had to clock it at just 800MHz. In reality Cape Verde is such a small GPU that it can easily hit higher clocks, but since 7750 was already approaching the limits of a PCIe slot, there wasn’t much headroom to work with. As such AMD has minted a new 7750 reference design for their partners to work with. The new 7750 (which we’re dubbing the 7750-900) utilizes the exact same Cape Verde GPUs, but is clocked at 900MHz rather than 800MHz, which given AMD’s near-linear performance scaling should put performance at around 10-12% higher than the original 7750-800. On the hardware side of things the real change is that in order to achieve this AMD had to increase the amount of power the card could be supplied with, which means they had to give up on only drawing power from the PCIe slot and to start using external power too. The new 7750 reference board – which we’re told is very similar to the 7770 reference board – is a longer board that features a PCIe power socket in order to provide that additional power. Accordingly the PowerTune limit/TDP has risen from 75W to 83W. And to be clear here, the new 7750 is as official as any other AMD defined product; this is not a factory overclocked part where partners are technically running a part out of spec. AMD will be qualifying all 7750 GPUs to run at both 800MHz and 900Mhz, and partners will have the option of using their 7750 GPUs to either build the 7750-800 or the 7750-900 based on their market needs. For that reason both models will continue to exist on the market. Unfortunately this also means that they will be sharing the same name. AMD has told us that they don’t want to make their product stack more confusing by adding to it, which is understandable. At the same time however this is the textbook case for a new SKU; 7751, 7755, or 7760 would all be appropriate choices and far less confusing since the 7750-800 is a unique card due to its power requirements. As it stands the only way to tell apart the 7750-800 and 7770-900 is going to be based on clockspeed. As for pricing and availability, the 7750-900 is available now, while pricing is still in flux. XFX’s Radeon HD 7750 Black Edition Double Dissipation is the first 7750-900 card on the market, and other partners will be putting out their own 7750-900 cards soon. We don’t have a clear shot of the front of the PCB, but Newegg has posted a shot of the far edge, where we can clearly see the PCIe power socket and part of the PCB, which also makes it clear that this isn’t a 7770 PCB. AMD’s official MSRP for the 7750-900 is the same as the 7750-800 at $109, while XFX is charging $115 after rebate for their card. Given the higher performance of the 7750-900 we don’t have a great deal of confidence that AMD’s partners will actually roll it out for $109, but given the fact that the 7770 is down to $129 they may not have a lot of choice. Finally, the fact that AMD has chosen to launch a higher clocked 7750 at this point in time is by no means a coincidence. 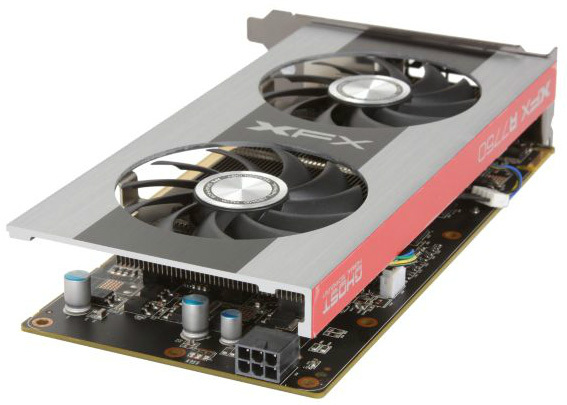 With the impending release of desktop GK107 cards – the OEM-only GK107 based GT 640 was announced back in April – this is an obvious counter-launch. AMD would appear to be expecting GT 640 pricing to be near the 7750, which would explain the need for a higher clocked card at the same price. We’ll be looking at 7750-900 performance next week when our reference sample arrives, so we should be better able to quantify performance and power then, along with what NVIDIA’s performance would need to be if indeed they’re targeting 7750 pricing. Our brilliant fellow posters won't notice the : " Now at 900mhz ! " in big yellow letters on the box, and of course they will fail to have a 250 watt PS and extra molex to power the 6 pin, and won't notice it has a 6 pin either. Where were you when the 8800gt became the 9800gt? "Where were you when the 8800gt became the 9800gt?" I bet they laugh at the immense hilarity of the suddenly incapable and incompetent. Haha, no. Free extra performance..
NVIDIA still rules the roost by a long way when it comes to fucked up naming. ... and so on, and so on. You could go through and list all the rebrands too. Just f*ckin call it an HD7760 already. They've got 4 digits and still can't figure out how to make good use of them..